If you thought you were done buying all your outdoor & garden equipment, think again, now you need somewhere to store all these items! But, that doesn’t necessarily mean you have to spend loads of money and buy a big shed, because a small plastic garden shed might just be enough. Small plastic garden sheds are ideal for storing your garden essentials as well as larger equipment such as your 6 burner gas BBQ, garden patio heater, bicycle and garden power tools. However, if you don’t need to store any larger equipment, then maybe just a plastic garden storage box might be big enough. Since buying a plastic storage shed is practically maintenance free, it remains a very popular choice. In addition, there are many other benefits of buying a plastic storage shed. We will now take a look at the best plastic sheds for smaller gardens or for those who require less storage space. Constructed from durable plastic with steel reinforcement. 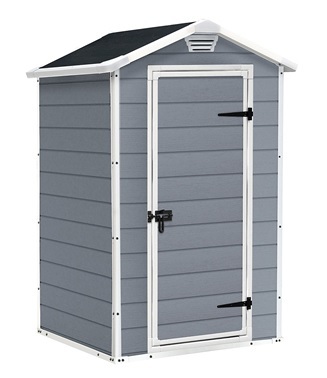 Weather resistant resin material ensures the shed is not affected by weather elements. Built-in air vents to provide air circulation and window to provide light. Heavy duty flooring protects your equipment from dirt and damage. Lockable door as a security measure. Some parts feel quite cheap and low quality. 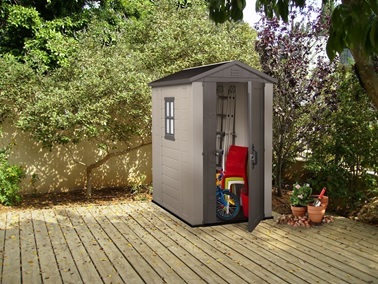 The Keter Factor 4x6ft plastic garden shed is a great size shed for to store smaller and larger items. Its durable construction and weather resistant outer material means that it’ll comfortably survive sun, rain or even snow! Assembling this outdoor plastic shed shouldn’t cause much difficulty at all and don’t require any special tools. Comes with floor panels for extra protection. Built-in padlock hasp for optional added security. Wood effect exterior for a classic look, but remains paint and varnish free. 1800 litre capacity which is still 3 times bigger than a jumbo garden storage box. Internal structure not very strong. Despite the Keter Manor 4x3ft shed being smaller, don’t be deceived, it can still store quite a few items. Perhaps not the best small plastic garden shed for items such as larger garden furniture, but it’s great for long items that can stand upright such as a cantilever garden parasol. You can conveniently slot this narrow plastic shed in tight or narrow spaces, thanks to its space saving design. Made from durable rib-reinforced weather resistant material. Includes adjustable brackets to allow you to put shelves in. Wide double doors enable you to easily access or put away equipment. Heavy duty 105 degree carpenters chrome hinges for added support. Customise the colour of the exterior as the Duotech walls allow you to paint over it. Safely store your goods in this durable plastic garden storage cupboard, where you can the option to add shelves thanks to the adjustable shelving brackets. Adding shelves will be ideal for storing more smaller items, alternatively you can utilise the whole space for larger items without adding any shelves. The wide double doors make it easier to store or take out large items. Don’t worry about the Keter High Store Cabinet not matching your other garden furniture, as you can paint over the exterior Duotech walls. Now is your chance to show off your artistic side! Large 2000 litre capacity with weather resistant wood affect panels. Shelf support option if you want to add in your own shelf to increase storage space. Open from the top or double front doors to easily store or access your items. Flooring included and the opening lid is hydraulic piston assisted for effortless access. Assembling process may require a bit more DIY. Although the lack of height of this storage shed may make it look you can’t store as much, well it actually has a larger capacity than the Keter Manor 4x3ft storage shed. Since the Store It Out Ultra Shed is longer rather than taller, you can probably utilise the space more efficiently. With taller sheds, you won’t be able to utilise the entire height of the shed, unless you stack items on top of each other, but that’s not always practical! 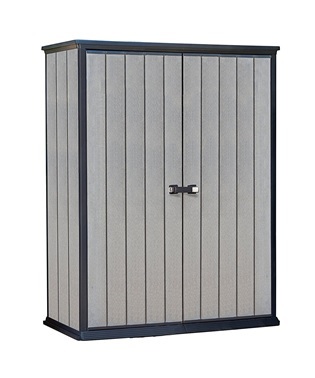 Perfect for storing bicycles, 3 x 120L wheelie bins or a mixture of garden equipment, furniture and power tools. The wide double doors and piston assisted lid ensures it’s easier to store away or access large items. Vinyl material ensures long lasting durability and maintenance free. Internal structure support is made from heavy duty galvanised steel. Fixed window offers natural light to enter the shed. Air vent above the door helps keep fresh air circulating inside. Long 15 year limited warranty. Assembly instructions may not be that clear for everyone. 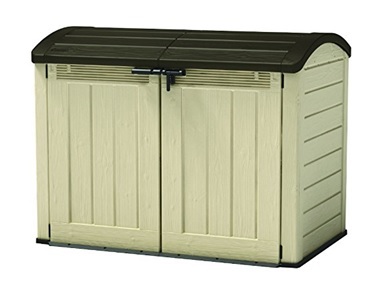 Invest in this long lasting small plastic garden shed to accommodate to your smaller storage needs. 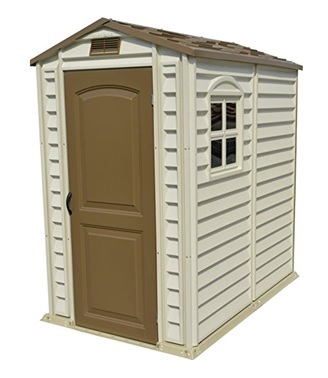 You’ll probably pay a little less than an equivalent Keter plastic garden shed 6x4ft, but still end up with a very good quality shed made by Duramax. Buy with confidence as Duramax offer a 15 year limited warranty on this product. Maybe you’re still in two minds whether buying a plastic garden shed is the best solution for your storage needs. Well, don’t worry because we’ve got that covered, below we’ve listed the pros and cons of buying a plastic garden shed, so you can decide for yourself. Made with weather resistant material, so not really affected by rain, sun or snow. Usually relatively easy to set up as there are no special tools required. Only very little maintenance required, but probably can get away with no maintenance. Overall security can be weaker, thus, less difficult to break in. Poor protection against strong winds. Either very little or no customisable options. Not as practical to drill holes in the walls to add your own shelves or hooks as the walls are not really designed for this. However, some models do have built-in shelving support. Not susceptible to rusting, rotting or wood eating insects. Now that we’ve gone through our list of the top 5 best plastic sheds for small gardens or less storage requirements, you should have more of an insight as to whether this is the best option for you. If you happen to live in a location where you often get hit by heavy wind, then you’ll need to take this into consideration, as heavy winds can either knock your mini plastic shed over or even break it apart. However, if the internal structure is supported by steel reinforcement or the shed is of good quality materials, this is unlikely to happen. Don’t be put off by this though because the sheds in the list above are all made by reputable manufacturers. Unlike wooden sheds, plastic ones can usually be assembled by two people without too much difficulty. 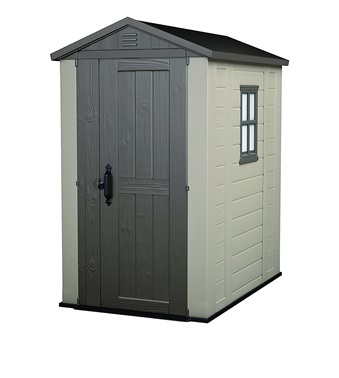 And, if you just don’t have time to upkeep your shed then this type is pretty much maintenance free!